Many of you may remember this Olympia of mine from last year. 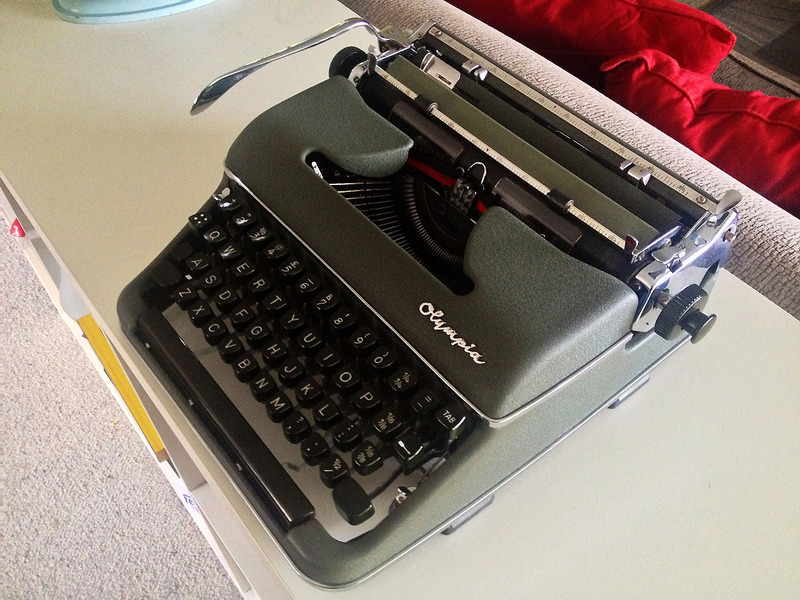 It is a near pristine Olympia SM3 which I used for a special purpose during a prolonged difficult period at work. There’s a bit of a story behind this typewriter though, which I think is worth telling. Many of the typosphere have tales of anguish and grief of buying on ebay. and while much of the trauma appears to center around the packing and postage of these items, there’s often plenty to be said about the sellers themselves. But what happens when you go and collect your own purchases, instead of having them posted to you? I’ve been using ebay for easily a decade now, and I’ve collected purchases from many interesting locations. One of my first unusual collections was an Apple IIc that I picked up from a alternative lifestyle commune located on the outskirts of Melbourne. As for typewriters, the pickups have been consistently interesting. 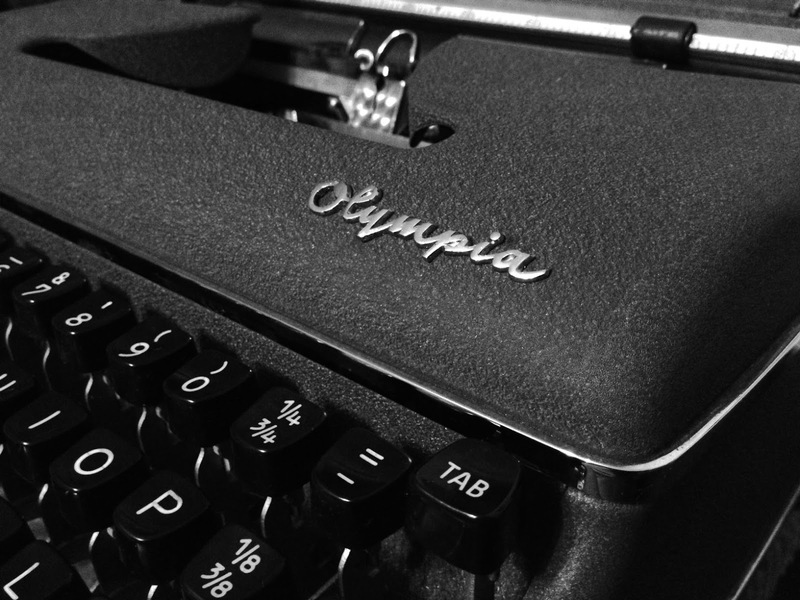 Nothing ever seems particularly straight-forward, and this Olympia SM3 was no exception. I was worried I was going to pay too much for this machine. It was just a smidge above the $50 mark, and no one else had bid. The photos of the machine told me nothing – not even the colour. They were blurry, and tinted a very warm orange. I could tell from the photo that it was complete, and I suspected that it had a script typeface (which it didnt) so I put down a bid which won uncontested. D-bay is the local name for the suburb of Brisbane actually known as Deception Bay. It an area made up of cheap 1970’s and 80’s housing estates, and a few older 1960’s farming homes. Council planning of the area 4 decades ago was been awful, and it soon became something of an isolated lower-middle class backwater and a cultural wasteland. The deception bay cultural hub: Booze, pizza, fishing tackle and two supermarkets side by side. I didn’t call Greg. I mailed him to inform him that I couldn’t come that day, but I would drop by later in the week. Greg replied with his address, and simply said ‘call 15 minutes before you come’. So, on a Wednesday afternoon I called him – just as I was collecting my car from a service. It took me about 20 minutes to get to Greg’s place, which would have been shorter if the Tom Tom app on my phone didn’t do all kinds of weird backflips and spin-arounds. I pulled into the small court that his house was located in, and I was confronted by an awesome sight. While most of the houses around Greg’s place were run-down weatherboard shacks and were littered with car parts and rusted hulks, he lived in a towering 80’s white painted double story arched-fronted monstrosity with a 6 foot high iron picket fence. The garden behind the fence featured concrete fountains with cherubs and dragons, and mini Grecian pillars. Ahhhhh the Greeks. I’d expect to see this kind of thing in Melbourne rather than Brisbane. It all felt very out of place. But something else was not right. Not by a long-shot. There were security cameras bolted to the top of almost every support post of the fence. Not just little ones, but 1.5 foot long armored cameras. There were 4 of them in total, and every one of them faced out onto the street in a different direction. Not only that, but they were so heavy that some of the fence posts had started to sink and topple with the weight. I looked through the fence and I could see a guy sitting on a chair in the middle of the driveway. I called out to him, but he didn’t seem to hear me. However his dogs did. The two of them raced towards me growling viciously, and almost decapitated themselves trying to get through the fence. They seemed to be some kind of Shih-tzu/Piranha cross. I took a guess that the sitting fellow was Greg, and I subsequently called out his name. This time he responded. He jumped up from his chair in an awkward fashion, and had a very goofy smile on his face. He was about 6’7″, and lumbered with a clear lack of self-consciousness and grace. “Scott”! he called out, as though I was a missing friend. “Is that you”? “Hey”, I replied – with all the self-consciousness that Greg was missing. “Come in! Don’t worry about the dogs, they wont hurt you”. ‘They won’t hurt me’? I wondered to myself. ‘They’re freakin’ Piranha on legs! I pushed the gate open, almost crunching the dogs as I did. They rushed around the gate to meet me, and the jumped up my legs and propped against me with their paws while licking my fingers lovingly. “GO on, Get”! Greg yelled to the dogs, sweeping a bit of a kick that missed them. They dogs quickly scurried off to a spot somewhere to the back of the property, and then started growling at each other. “So, you want the typewriter”. Before I could answer Greg, he turned and disappeared into his garage. There were no cars parked in there, and there was a car-port that had been extended onto the front of it for the cars to park under. The garage was filled with rows of cupboards and wooden shelves. On each shelf was an array of trinkets of almost every kind you could thing of. They were incredibly neatly organized, and some were even labeled. “This is my business” Greg explained to me. “Do you want to go and look? This is the stuff that I’m selling on ebay – Go look’! I declined Greg’s enthusiastic invite, and he seemed disappointed that he wasn’t going to show me his haul of goods. But his eyes lit up again the moment he remembered the typewriter that was in his hands. “It’s like new”! He said as he slapped the familiar SM3 case down onto a table. He then stuffed his oversize frame onto a kiddies chair in front of it, and opened the case. “It’s a real ripper”! Greg started banging furiously at the keys before exclaiming “See! Give the keys a try”. He wasn’t kidding. The case was a bit worn, but the machine inside it glistened like it was brand new. There was barely a hint of dirt on it, and it sparkled in the afternoon sunlight like it was a mirror. The machine was perfect. Almost disappointingly perfect – as there appeared nothing for me to fix. We exchanged pleasantries and money, and I soon had the awfully heavy case in my hands. But he wasn’t going to let me leave without showing me at least some of his other treasures. He was currently working on a miniature indoor hydroponic plant kit. I remember seeing one of them a few years ago being flogged in an informertial that marketed it as ‘Your indoor fresh herb garden – right there in your kitchen’. He was trying to get it working, but couldn’t figure it out. I guess he picked it up at a garage sale, and there was a piece missing. I told him what bit I thought was missing, and without warning he disappeared back into his garage then came back with something that would perfectly substitute for the operation of the missing part. “Great! That’s going on ebay this afternoon now”. There were old tools, garden gadgets and interesting cutlery. When he got to showing me the ceramic cats, I decided it was past time to got the frak out of there – so I politely took my leave. He just simply stopped talking to me, and nodded his head and waved a good-bye. I made my way out the gates, and looked back over my shoulder. He was standing at the gate just watching me go to my car. The dogs rushed up and started to bark furiously again. I drove off and left him to his treasures, his Grecian ruin garden, and his dogs. I got the machine home and put it on the dining room table. The machine was immaculate, and didn’t have a scratch on it. The chrome hadn’t flaked or bubbled or pockmarked, and the machine’s operation felt as though it was new off the factory floor. It was incredibly sharp and unhindered. The platen was hard, and the ribbon was mostly dry, but I gave the machine a good go. And I was impressed. I mean, really impressed. As I started to get used to the keyboard, my speed picked up. 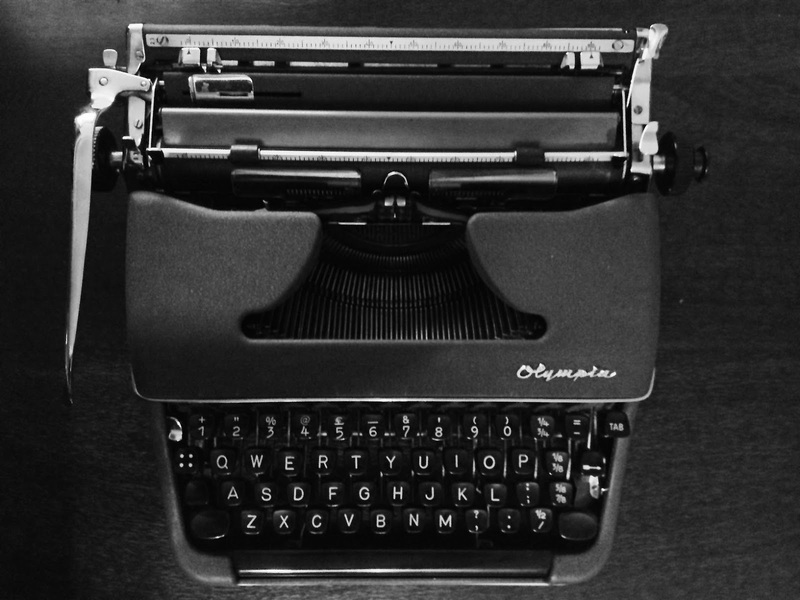 Before long I was typing faster than I had ever typed on a typewriter keyboard. I was getting close to the speed that I was capable of on my computer’s keyboard – that is to say, around 80 – 90 words a minute at full trot. I looked closely at this keyboard, and found that the keytops themselves were individually spring loaded. Amazing! According to various sites that I read, this was made to allow the key to stay level when pressed – sort of like how my Bijou does. However, I’m not convinced. In real terms I can make these keys easily bounce off my fingers if I just lightly jab at them, which while typing really seems to let me just casually gloss across the tops of the keys with great speed. Or at least that’s what I think I am doing. It has hard to really assess what my fingers are doing when they are working at their fastest. After I had played with this typewriter for a while, I remembered that I had a disfunctional SG1 down in the shed, waiting some serious investigation as to why it wasn’t working. I was so impressed with the engineering of the SM3, that I then decided that I would attempt to tackle the difficult repair with a higher priority. I often think about that eccentric seller, and wonder if I’ll end up buying off him again. The other professional ebay seller I have bought off on ebay has had two visits from me. Maybe there’s a nice little supply of typers near by. Great story of the SM-3. It sure is one immaculate looking machine. I wonder why it does have that one key if it's not script? UK keyboard! Check out the fractions and the currency symbol. Is the “1” styled differently than the lowercase “L”? It may have the dullest of colours, but it is one of my favorite writing machines! From what I can tell, all of the Olympia De Luxe variants have the '1' key. However, my SG1 also does but isn't a de luxe. Yeah. Pretty much all Australian machines have a UK keyboard. The '1' is a very distinct '1' when printed, and is quite different to the 'L'. But not as different as the '1' on my SG1. That said, this SM3 has quite a different typeface to the standard machine. It is a serif typeface, but isn't the rather standard 'courier' pica variant. That has to be one of my favourite colour (or lack of) schemes on an SM. And what a story! I had to come back and read it a second time. I need to get one of the SM3s out for a spin. Thanks for sharing the great story and photos. It's certainly a subdued colour! Its a change from black at least, without being so – in your eye with retina burning tones. On you'll love it if you can get your hands on one in good condition. Great little machine.